What Does High School Bullying Look Like? The film is a realistic, unscripted look inside the world of high school bullying through the eyes of both the bully and the victim. The film will be opening in Boston on Friday, March 27 – playdate theaters are still TBD. Written and directed by Amy S. Weber, A GIRL LIKE HER is an unscripted, poignant feature film that takes a realistic, inside look at bullying through the eyes of both the bully and the victim. As the film explores the connection and relationship between two individuals, it shines an unbiased light on the teen bullying epidemic and society’s role in breaking the cycle. 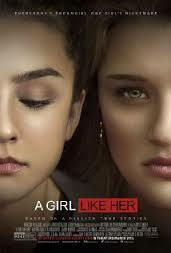 With powerful performances from a cast including Hunter King, Lexi Ainsworth, and Jimmy Bennett, A GIRL LIKE HER reminds audiences what it means to listen in a world where emotional pain hides behind many façades. Category: Events, Newton Schools · Tags: What Does High School Bullying Look Like?